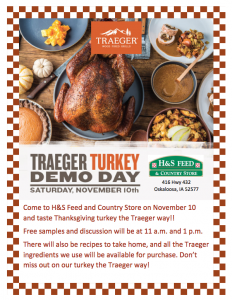 Join H&S Feed & Country Store for Traeger Turkey Demo Day on Saturday, November 10th. We’ll be sampling a Thanksgiving turkey cooked on a Traeger Grill at 11 a.m. and 1 p.m. Head on over for free samples and pick up some Traeger grill recipes. Look over our Traeger Grills, spices & rubs, wood pellets, accessories, and supplies while talking to our experts. Traeger wood pellet grills pack big hardwood flavor, from sweet cherry to savory mesquite, into everything you grill, smoke, bake, roast, braise, & BBQ. Traeger’s wood pellets are made with 100% pure, natural hardwood giving you authentic flavor and nothing else. Grilling has never been easier—just set it and forget it and let the Traeger work its wood-fired magic. This entry was posted on Wednesday, October 31st, 2018 at 8:41 pm	and is filed under Events, News & Updates. You can follow any responses to this entry through the RSS 2.0 feed. Both comments and pings are currently closed.